All of the seven bedrooms are carefully decorated to incorporate the different themes – a culture of its own. Each room is spacious, with aircon, television, tea and coffee facilities. A Knights Rest offers quality, tasteful accommodation, with simplicity. Please Click on the link below to find out how to arrive at our Guesthouse from the airport. OR Tambo International Airport Station is an elevated station with platforms situated on a viaduct. The Station concourse is directly linked to the departures level of the adjacent new central terminal building, one level below. The majestic Voortrekker Monument is situated in the northern part of South Africa in the Pretoria (Tshwane) region in a nature reserve. It is a unique Monument which commemorates the Pioneer history of Southern Africa and the history of the Afrikaner and is situated in a beautiful setting. Today it is the most visited heritage site of its kind in Gauteng and one of the top ten cultural historical visitor attractions in the country. The Monument also manages the Blood River Heritage Site. The Union Buildings form the official seat of the South African government and also house the offices of the president of South Africa. The imposing buildings are located in Pretoria, atop Meintjieskop at the northern end of Arcadia, close to historic Church Square and the Voortrekker Monument. Though not in the center of Pretoria the Union Buildings occupy the highest point of Pretoria, and constitute a South African national heritage site. The Pretoria National Botanical Garden was established in June 1946 when the University of Pretoria granted approval to the Department of Agriculture for the development of a botanical garden on a piece of land that was previously part of the University's Experimental Farm. The Garden has a presence of an abundance of poison leaf (Dichapetalum cymosum), a plant which is poisonous to livestock. The Garden was officially opened on 23 October 1958. This reserve is famous for its magnificent specimen of Ficus salicifolia, a wild fig called the "Wonderboom". The fig tree is older than 1 000 years. Legend has it that it grew this big because the chief of an indigenous tribe lies buried beneath its roots. Over the years the branches have grown longer, gradually hanging lower until they touched the ground, rooted and produced a circle of daughter trees. There are now 3 circles of daughter trees surrounding the original tree. Come take the interpretation trail from the new boardwalk in and around the tree. This is South Africa’s third largest cave and one of the most beautifully decorated. Easily accessible from the Rhino & Lion Nature Reserve, part of the Cradle of Humankind World Heritage Site, the approach to the Wonder Cave gives little clue of the geological wonders that lie beneath. Reasonable fitness is required to tour the Wonder Cave. Whilst no crawling or arduous physical activity is required to complete the tour, the 88 steps that lead you into, and out of, the cave tend to leave most visitors a little breathless! The name of the dam means "pass of the hartebeest" (a species of antelope) in Afrikaans. This "poort" in the Magaliesberg was 'n popular spot for hunters, where they cornered and shot the hartebeest. The dam was originally designed for irrigation, which is currently its primary use, as well as for domestic and industrial use. The dam's hazard potential has been ranked high. Hartbeespoort was previously known as Schoemansville, after General Hendrik Schoeman. The Rhino & Lion Nature Reserve is a privately owned, non-subsidized game reserve, covering approximately 1 200 ha on the typical Highveld of Gauteng. The reserve is situated in the "Cradle of Humankind", a declared World Heritage Site, about 40 km north-west of Johannesburg and 60km west of Pretoria. Our Guesthouse is situated near a main road, making it accessible to public transport. Arriving from OR Tambo International Airport? No problem, find out how to arrive at our Guesthouse for OR Tambo International Airport. 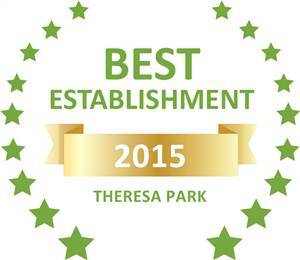 Based on reviews of establishments, A Knights Rest has been voted Best Establishment in Theresa Park for 2015.